Happy birthday to Berni, my big sister! Although I've got a good 4 inches on her. Happy birthday to Berni. You're not only 4" taller than her, but you haven't got a pipe growing out of your head, as shown in the picture. hahaha Ben, I know - it appears I got the good genes in the family! Thanks Stephanie, but I didn't even get any cake! Happy Birthday Berni ... rock on!!! Why is she in a chair that has a plug attached? Is that an electric chair? Don't plug that in now. 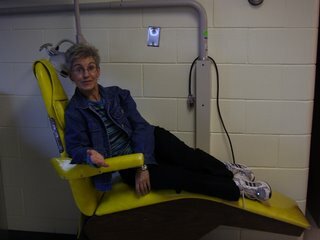 It's a dental chair, Barbara W. For some reason they have one in the party room where my mom lives. I guess in case they want to do some dental games.